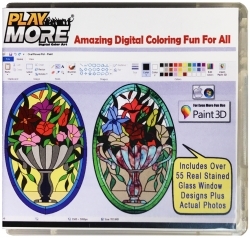 The Playmore® HD Color Art Library is a digital collection of over 1,200 high-resolution coloring-book-like line art files that are stored on a 2 GB USB Flash Drive for children and adults to open, create with, and color using Microsoft Paint, Paint 3D, or a similar program like Paintbrush for MACs. Wexford, PA, October 26, 2017 --(PR.com)-- AZ Direct, LLC on Wednesday formally announced the release of the HD Digital Color Art Library under the brand name PlayMore®. Early in 2017, the Windows 10 Creators Update by Microsoft added Paint 3D to more than 400 million Windows 10 devices now in use. Paint 3D is a powerful art design studio application that includes the ability to add 3D elements into art designs and turn a 2D doodle into a 3D image. Now with the PlayMore® HD Color Art Library children that fire-up Paint or Paint 3D can replace the blank white art canvas with one of hundreds of fun and inspiring line art designs created by a variety of amazing artists and unique art styles. These art files can be colored right away, or added to a starter scene before coloring them. It’s like having the ability to build your own coloring book page. The variety of art available for creative projects ranges from common life creatures and man-made items to fantasifull scenes and characters, all included in the USB flash drive art library for creating designs and coloring. Now with Paint 3D children can take their 2D designs to new levels by creating or adding 3D objects into their 2D design scenes. With the PlayMore® HD Color Art Library artists become “art directors” empowered and inspired by access to a library of over 1,200 high-def line art files for creative art projects. For adult coloring book lovers and older children, included in the art library are almost 350 intricate Mandalas, complex patterns, spirographs, and geometric shapes that can be colored perfectly online with millions of colors, or printed on paper and colored with pencils or crayons. Also included for those who take pleasure in coloring art are the designs of over 55 genuine stained glass windows from homes all over the world. These designs were converted into high-def line art for digital coloring. After coloring them artists can compare their colored designs to those of the original glass artist using photos of the original windows that are also included in the art library. “I believe that Paint and now Paint 3D both are very powerful art design tools for entertainment and education, yet these powerful applications are under-utilized in the majority of homes with windows on their PCs, laptops or tablets,” said Jim Cofano, the PlayMore® art library curator. “I believe that starting with a blank white screen wondering where to begin deters users, and that having access to a library of starter art will inspire more people to enjoy the benefits of creating and coloring art using Microsoft Paint/Paint 3D." "This might be the perfect Christmas gift item for families with children for boosting the amount of time kids spend creating and coloring art (while moms relax! )," Cofano adds. Microsoft® Corp. is the leading platform and productivity company for the mobile-first, cloud-first world, and its mission is to empower every person and every organization on the planet to achieve more. AZ Direct, LLC was founded in 2014 by Jim Cofano to provide digital marketing consulting services and the PlayMore® brand was registered in 2015 to bring new products to market.